There’s one big plot point left ambiguous at the end of Final Fantasy XV, so I thought I’d ask director Hajime Tabata about it. In an interview earlier this month, he offered some helpful clarification, also acknowledging that the game’s story was a bit... messy. Spoilers follow, obviously. I mean, did you really see a headline about Final Fantasy XV’s ending and think, “Wow, this will be a nice spoiler-free discussion?” There are spoilers here. Don’t say I didn’t warn you. If you read any further, you will be spoiled. Final Fantasy XV concludes in tragedy, as the protagonist, Noctis, sacrifices his life to prevent the antagonist, Ardyn, from completely destroying the world. The last thing we see is an image of Noctis and his bride-to-be, Luna, kissing in the afterlife. 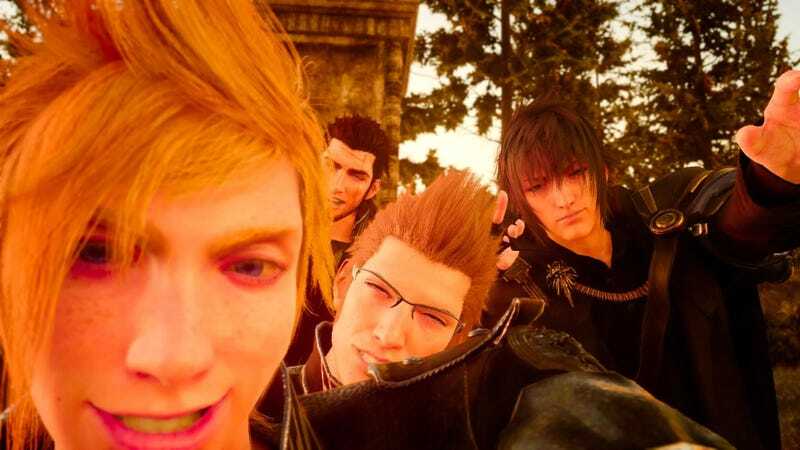 What we don’t see is what happened to Noctis’s friends: Gladiolus, Prompto, and Ignis. When Noctis goes after Ardyn, they stay behind, fighting off a wave of powerful monsters in what appears to be a sacrificial last stand. Well, Tabata says they’re alive. And although he said we probably won’t see any future downloadable content that shows what happens to Gladiolus, Prompto, and Ignis after the credits roll, he did assure me that their ending is not going to be happy. As for the game’s other loose threads? Well, Tabata wouldn’t tell me who Noctis’s mother is, hinting that that might be a plot point in the future. (“I can’t say right now.”) He also didn’t have much to say about why the gang cared so much about our dearly departed friend Jared, pointing out that the focus of that bizarre scene should have really been on Jared’s grandson, Talcott, in whom Noctis sees some of his own pain. Even Final Fantasy XV’s staunchest defenders—of which I am one—would agree that the game’s story felt messy and incomplete. Tabata agrees. “Understandably within the main game there were certain aspects that lacked explanation, and that’s been some of the feedback we received from fans,” he said. So I asked a question that many fans have been asking: Were those narrative deficiencies because of Versus XIII, the original incarnation of FFXV that was then rebooted and handed to Tabata in 2013? Was Final Fantasy XV’s story so scattered because Tabata had to salvage a plot that wasn’t his? This piece originally appeared 9/13/17.